The eight persons elected to the 2013-2015 ELT. L-r: Gary Dilley, Robert Eberly, Molly Kesler, Tim Krugh, Dan Paternoster, Dennis Sites, Lester Smith, Greg Voight. 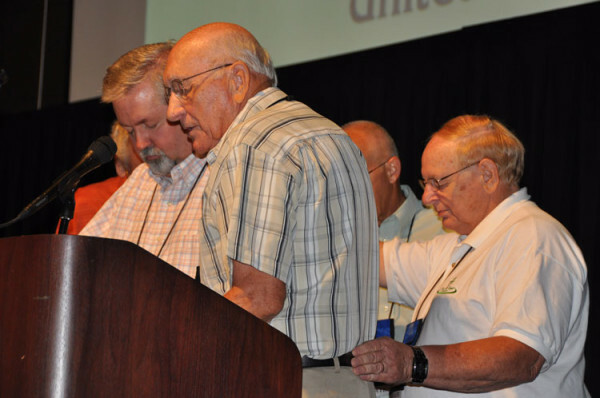 Every two years, the US National Conference elects eight members of the Executive Leadership Team–1 layperson and 1 ordained minister from each of the four districts. The new ELT will later appoint four additional members, 1 from each district. Half of the persons elected are new: Dennis Sites, Bob Eberly, Greg Voight, and Gary Dilley. That means a turnover in three of the four clergy positions. In 2011, only one new person was elected to the ELT–Tim Hallman. Of the continuing members, Dan Paternoster has served by far the longest, now beginning his 13th year on the ELT. Lester Smith has served since 2005, Tim Krugh since 2007, and Molly Kesler since 2009. Interestingly, two pastors’ wives who have been members of the ELT since 2005 chose not to run again. However, their husbands–Dennis Sites and Greg Voight–were elected to the ELT. Here are the results of the 2013-2015 ELT ballot. The persons selected are indicated with italics type. The location of their church is also given. Bishop C. Ray Miller (foreground) praying for Bishop Whipple as he begins a second term. L-r: Ron Ramsey, Phil Whipple, Ray Seilhamer, and C. Ray Miller. Standing behind Bishop Whipple, mostly hidden, is Paul Hirschy. Bishop Emeritus Ray Seilhamer is praying for Bishop Whipple. Phillip Whipple was re-elected a bishop of the Church of the United Brethren in Christ, USA. He was first elected in 2009, and will now serve another four-year term as bishop. The election came Thursday morning, June 27, during the business session of the US National Conference. Todd Fetters, assistant chairman, introduced the ballot for bishop, and gave some background, noting that they would follow much the same procedure employed in 2009, when there was also just one name on the ballot. Then Kevin Cherry, chairman of the Nominating Committee, gave some remarks about how they were led to present a ballot with just one name. The “Rules and Procedures” states that ballot must contain twice the number of persons to be elected. So first, they had to suspect that rule (this has been done many times in the past—just once for bishop, but various times when we elected national directors). Todd Fetters then invited additional nominations from the floor. Molly Kesler, a member of the Executive Leadership Team, came to a microphone. She said she had approached two persons about letting their names run for bishop, and that both had said yes. One, she said, was Chuck Malson, pastor of Brown Corners UB church in Clare, Mich. However, she said, Malson subsequently declined, saying he was still committed to serving his local church. The other person, however, and said “yes”–Lester Smith, pastor of the UB church in Hillsdale, Mich. She placed his name in nomination. Lester Smith came to the microphone. He said he was “wired for personal evangelism,” and didn’t think the bishop’s position—“in the unlikely event I was elected to it”—would provide the right opportunities to fit his gifting. He thanked Molly for the nomination, but then declined to let his name run. 1 vote each for Chuck Malson, Dennis Miller, and Tim Hallman. “This body has elected Phil Whipple as its bishop,” declared Todd Fetters. He invited the bishops emeriti—C. 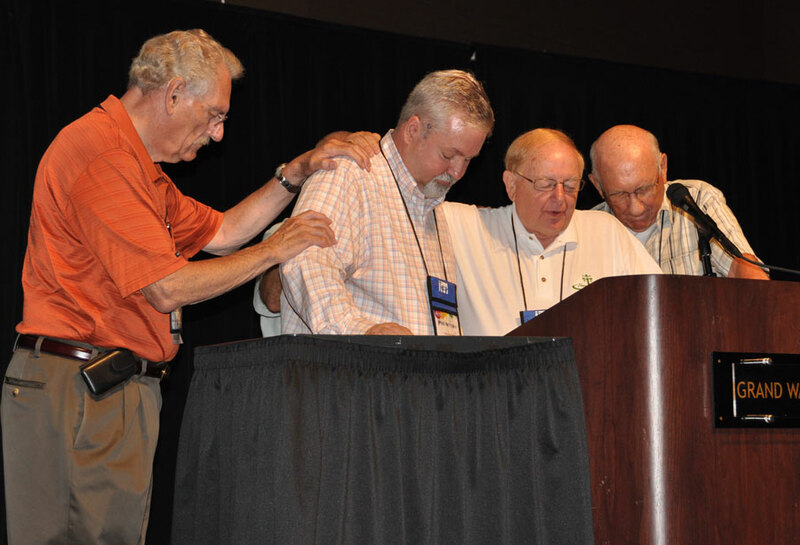 Ray Miller, Ray Seilhamer, Paul Hirschy, and Ron Ramsey–to come gather around the bishop on the platform. All four bishops laid hands on Bishop Phil Whipple, and bishops Miller and Seilhamer offered prayer. UBs trained to evangelize among the Vai people. The month of April was a busy time for the outreach team working in Pujehun Province in Sierra Leone. The outreach effort was led by Rev. Peter Kainwo (right), the conference director of Evangelism and Church Planting. Outreach consisted of multiple presentations of the Jesus Film in the Mende language and community visitation among the Vai People by 19 volunteers who were trained prior to the outreach effort in household evangelism. In all, a total of 6,489 persons viewed the film and 4,362 made decisions to follow Christ over the course of the campaign. Although they would like to have continued on to additional towns and villages, rain made the road impassible. 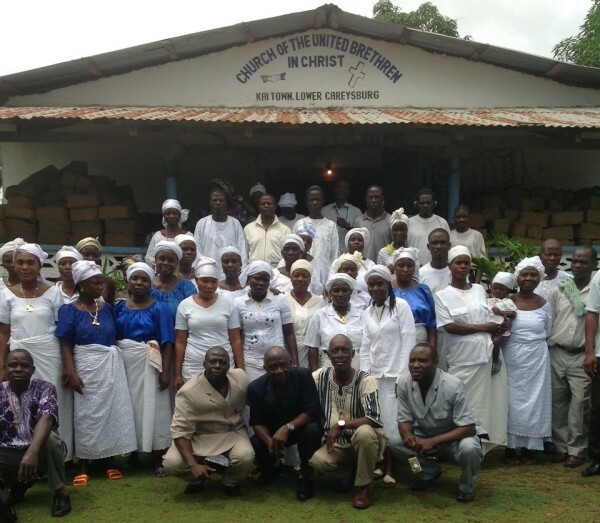 At the end of the campaign, a team of conference leaders traveled into Liberia to visit with a congregation eager to align themselves with the Sierra Leone United Brethren in Christ. Rev. Kainwo asks that we continue to pray for their outreach efforts, and for the identification and training of local leaders. The Sierra Leone Conference thanks everyone for the prayer support and for the funds made available for the transportation needs through Global Ministries Antioch Fund. Here are some further notes for persons attending the US National Conference this week in Fort Wayne, Ind. The Grand Wayne Center is located in the heart of Fort Wayne, Ind., at 120 W Jefferson Blvd. Two one-way streets go through the center of town–Jefferson (going east) and Washington (going west). The Grand Wayne Center borders both of those streets. There is a parking garage off of W. Jefferson, next to the Hilton Hotel (where many attendees are staying). Calhoun Street runs between the parking garage and the Hilton, and a Skybridge connects the two. The entrance to the parking garage is on Jefferson. Once inside, you’ll see signs pointing you to the registration area. Many others are staying at the Courtyard by Marriott, which is across the street from the Grand Wayne Center. It has its own parking garage. Across the street from the Grand Wayne Center is Parkview Field, considered one of the best minor-league ballfields in the country. There’s a great walking track all the way around the field, and it’s open to the public every day. So if you’re a walker, this is the place to get some exercise. In right field is the Huntington University Picnic Pavilion. We’ll have a morning prayer time there each morning at 7am, with various people in charge. It’s a great way to start the day right. One room has been designed as the Prayer Labyrinth. The Youth Ministry Team is providing this creative prayer exercise. The room will be open throughout the conference so you can go in and spend time with God in some unique, directed ways. It is totally self-guided. The Prayer Labyrinth can be found in the Foster Room in the Hilton (the same level as the Nursery and Children’s Ministry rooms). We encourage you to take advantage of it. Snacks, drinks, and other goodies will be available in the Hospitality Room. It’ll be a great place to kick back and relax. It’s on the 9th floor of the Hilton. Take the elevator and follow the sign. Check at the registration desk for hospitality hours. We’re once again taking photos of pastors and spouses. A room for this purpose will be set up outside the main ballrooms. The hours will be limited, so when you see somebody there taking photos, take advantage of the opportunity. When you arrive, you’ll see a lot of people wearing bright orange T-shirts with the conference logo. If you have questions about anything, ask these people. They are there to help. Ruth Benner, a former missionary in Sierra Leone, has been struggling with serious health problems for several weeks. Dan Nickless, pastor of Grace UB church (Sherkston, Ontario) where Ruth attends, reported that on Friday night, June 21, Ruth was taken by ambulance to Welland Hospital with a blood clot in her lung. Continued prayers for Ruth are encouraged. 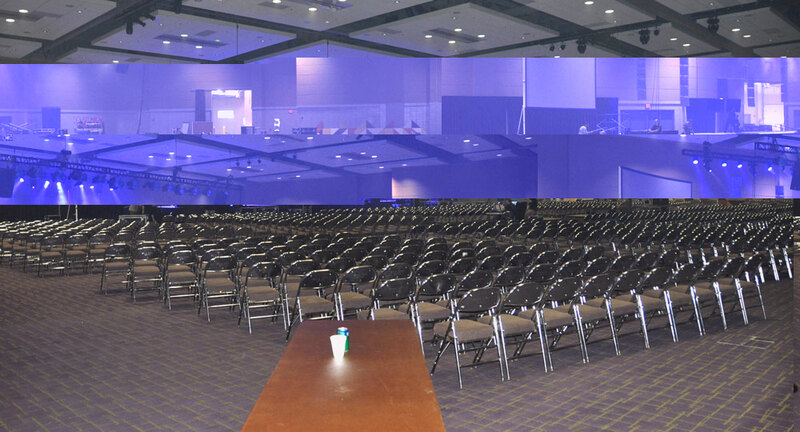 It’s only a few days away–the 2013 US National Conference. Registrations now stand at 834 (147 of them children and youth). Preparations are in high gear. We’re looking forward to a wonderful time together in fellowship, learning, fun, and worship. Here is some information registrants will be interested in. All business reports have now been posted on the conference website. Most can be viewed online. All can be downloaded in PDF format. 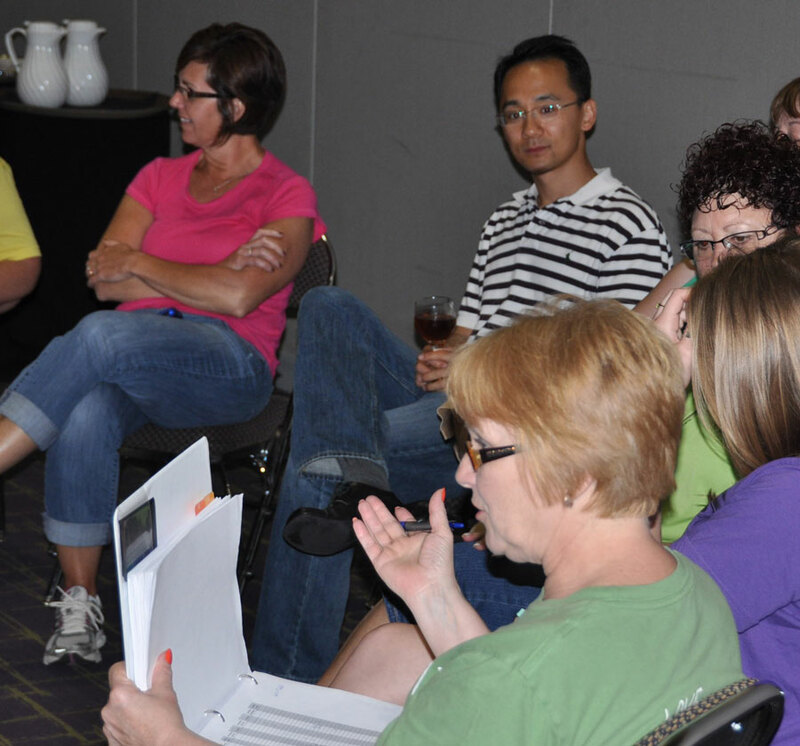 Make sure your church’s delegates have copies of the reports for the business sessions. You can download them from the conference website, and print out enough copies for your ministerial and lay delegate(s). It will be especially important to have a copy of Report 31, “Discipline Revision Proposals.” Much of the business will revolve around this report. Without it to refer to, you’ll be a bit lost. You can also print a copy of the Discipline, which might be helpful, too. We were going to mail packets of reports to persons who lack internet access, but circumstances prevented this from happening. However, those delegates will be able to request a packet of reports when they register at conference. You’ll also find ballots and biographical information regarding candidates for the two elections that will be held on Thursday: for bishop, and for the 2013-2015 Executive Leadership Team. The business session will be preceded by a breakfast at 8am. Anyone can attend the breakfast (not just delegates). We’re trying something new on Thursday night–a “Networking Reception.” It’ll be a way to meet fellow UBs who share the same interests or life experiences. Each table in the room will have a theme of some kind–bikers, youth workers, NASCAR fans, movie buffs, guitarists, military vets, schoolteachers, “The Voice” fans, children’s workers, drummers…about 50 in all. If you have something you want to showcase–a ministry or something else–we welcome you to set-up at an unused table. Everyone heads to Huntington on Friday afternoon. Figure on 2:30 or later. Much is happening at the Huntington University campus–tours in the afternoon, a picnic at 4:30, the Todd Agnew concert at 7pm, and balloon rides after the concert. You’ll also be able to tour the UB National Office, located adjacent to the university at 302 Lake Street. The three UB churches in Huntington will also be open for tours 2:30 – 4 pm. College Park church is just two blocks from the campus (1936 College Avenue). Check out the new family life center at New Hope Church, where Bishop Emeritus Ray Seilhamer is the pastor (2001 Engle St). Check on the progress at The Well’s new location at 1883 Old US 24. They plan to begin holding services there in August. Don’t want to drive to Huntington? We’ll have a signup at registration for shuttles back and forth. More information will be available at registration. Anchor UB church is just two miles from the Grand Wayne Center. Address: 1529 Third Street, Fort Wayne IN 46808. Emmanuel UB church is 11 miles to the west. Address: 12222 W. Jefferson Blvd., Fort Wayne, IN 46814. Union Chapel is 10 miles to the north. Address: 12628 Coldwater Road, Fort Wayne, IN 46845. South Scipio: 23 miles to the northeast (24990 Antwerp Rd, Harlan, IN 46743). Zanesville: 17 miles to the south (3092 Broadway St, Zanesville, IN 46799). Hopewell: 20 miles to the north (6852 County Road 35, Auburn, IN 46706). Several churches are located in Huntington, about 26 miles away: College Park, The Well, and New Hope. So if you’re sticking around, check out one of the local UB churches. They’ll appreciate seeing you. The Nominating Committee has submitted the ballot for bishop. It has one name on it: Phillip Whipple (right). In 2009, the US National Conference elected Phil Whipple as bishop. He has now served in that position for four years. Phil Whipple was born on June 23, 1957, and named Walter Phillip Whipple. However, he has gone by his middle name since birth. When Phil was very young, his father died. His mother remarried, and they moved to Illinois, where he spent his school days. Phil grew up in a strong Christian family where he learned the importance of prayer and obedience. He sensed God’s call into ministry at the age of 17, and began an educational journey through two Bible colleges before graduating from Liberty University. He attended Huntington University for graduate school. Phil took his first pastorate in 1984. In 1990, he joined the United Brethren Church as an as- sociate at Richfield Road UB church in Flint, Mich. In 1991, he was stationed as pastor of Pleasant Valley UB in Lake Odessa, Mich., and remained there for seven years. Phil became pastor of Colwood UB church (Caro, Mich.) in 1998 and stayed there 11 years. During that time, the church’s morning attendance grew from 200 to over 500, and they baptized over 130 people. Phil and his wife, Sandy, have been married for almost 30 years. They have two sons, Josh and Mike, both of whom serve on staff at Colwood UB church (Caro, Mich.). 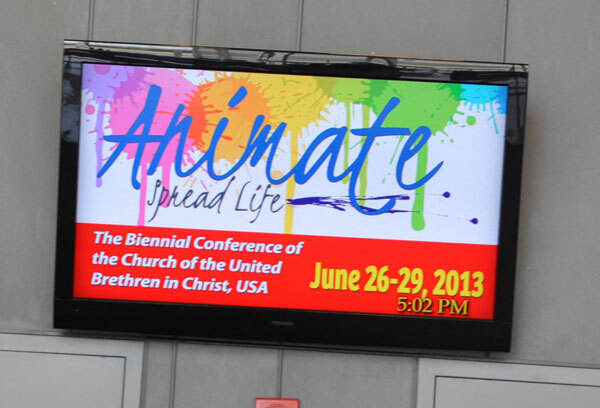 The election of the bishop will occur on Thursday morning, June 27, during the business session of the 2013 UB National Conference. As always, nominations will be allowed from the floor. Registrations for the US National Conference have surged well past the 800 mark, with 822 persons registered as of Monday, June 17. Of those, 151 are children and youth. Registration starts at noon. The first conference event is the Wednesday evening (June 26) evening service, which starts at 6:30 pm. Make sure your church’s delegates have copies of the reports for the business sessions. You can download them from the conference website, and print out enough copies for your ministerial and lay delegate(s). It’s especially important to have a copy of the “Discipline Revision Proposals” report. Much of the business session will focus on those proposals. Without it to refer to, you’ll be a bit lost. So make sure all of your delegates have a copy. You can also print a copy of the Discipline, which might be helpful, too. 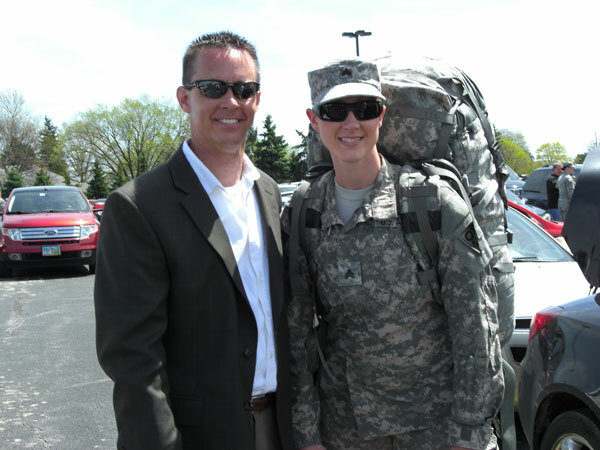 After nearly a year in Qatar with her national guard unit, Crystal Carpenter returned home on May 2. She is now reunited with her husband, Pastor Randy Carpenter, and her church family at Sunfield UB church (Sunfield, Mich.). The Yellow Ribbon ceremony was held at the Cedar Creek church in Perrysburg, Ohio, escorted in by the Patriot Riders and Law Enforcement.